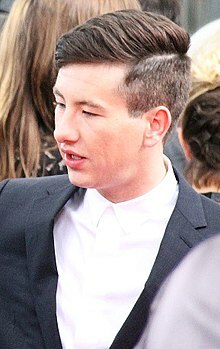 Barry Keoghan (/kiˈoʊɡən/; born 17 October 1992) is an Irish actor. He has appeared in the films Dunkirk, The Killing of a Sacred Deer, for which he won an Irish Film and Television Award for Best Supporting Actor; and Trespass Against Us. He also played the "heartless cat killer" Wayne in the RTÉ drama Love/Hate. Keoghan grew up in Summerhill, Dublin. Alongside his brother, he spent seven years in foster care, in 13 different foster homes. His mother died of a heroin overdose when he was 12 years old, and he was then raised by his maternal grandmother and aunt. As a child, Keoghan appeared in school plays, but was banned for "messing about". He started his acting career in 2011. He answered an advertisement for Between the Canals after seeing a casting notice in a local shop window, and portrayed Aido in a small role in the film, which was released in 2011. He then studied acting at The Factory, a local Dublin school. The same year, at the age of 18, he appeared in Fair City. In 2013, Keoghan appeared as the "infamous cat killer" Wayne on Love/Hate. The role earned Keoghan recognition in Ireland, and he went on to feature in '71 in 2014 and Mammal and Trespass Against Us in 2016. Keoghan appeared in two films in 2017. He featured as George Mills in Dunkirk and starred as Martin Lang in The Killing of a Sacred Deer alongside Colin Farrell and Nicole Kidman. He won the Irish Film and Television Award for Best Supporting Actor for his work in The Killing of a Sacred Deer. The following year, he appeared in Black '47 as Hobson, an English soldier stationed in Ireland during the Great Famine. He also starred in American Animals the same year. He portrayed Spencer Reinhart in the film, based on a real-life robbery of rare books from a university library. In 2018, The Hollywood Reporter described Keoghan as "the next big thing" for his film work in the previous three years, and in 2019 he was nominated for the BAFTA Rising Star Award. He will feature in mini-series Chernobyl in 2019. Keoghan is set to star in Y in 2020 as lead character Yorick Brown. Keoghan is an amateur boxer. He was scheduled to debut in September 2017 at the Celtic Box Cup, but was forced to withdraw due to injury. ^ a b Morgan, Maybelle (8 February 2019). "Barry Keoghan: The Dunkirk star who's mates with Colin Farrell and starred in some of the biggest films of the last two years". Wonderland. Retrieved 11 April 2019. ^ a b "Barry Keoghan goes from Love/Hate cat killer to toast of the Dior catwalk in Paris". Independent.ie. 24 June 2017. Retrieved 1 July 2017. ^ a b c d e f Mumford, Gwilynn (3 September 2018). "Barry Keoghan: 'You release your problems, playing another person'". The Guardian. Retrieved 11 April 2019. ^ a b "Barry Keoghan's story of growing up in foster care is harrowing, but the strength he took from it is inspirational". Joe. Retrieved 11 April 2018. ^ a b c d e f g Whitington, Paul (26 August 2018). "'My whole aim has been to show my range' – Barry Keoghan talks 'American Animals' and 'Black 47'". Irish Independent. Retrieved 11 April 2019. ^ a b c d e f "IFB and IFTA Announce Rising Star Award Nominees for 2017 – Irish Film Board/Bord Scannán na hÉireann". Irish Film Board. 24 March 2017. Retrieved 8 August 2017. ^ "Barry Keoghan specifically referenced Dublin 1 in his interview with The Hollywood Reporter". entertainment.ie. 11 May 2017. ^ a b c Gallagher, Jim (18 December 2018). "Barry Keoghan tipped for 'breakout in 2019' by The Hollywood Reporter". Irish Independent. Retrieved 11 April 2019. ^ a b Blake Knox, Kirsty (29 July 2018). "Barry Keoghan 'waiting for the right roles' as he films HBO's $250m 'Chernobyl' series". Irish Independent. Retrieved 11 April 2019. ^ Clarke, Donald (1 September 2018). "Barry Keoghan: 'My mother would be pretty proud. And surprised'". The Irish Times. Retrieved 11 April 2019. ^ O'Grady, Sean (2 September 2016). "The guy who shot the cat in Love/Hate is set to star opposite Colin Farrell and Nicole Kidman". Irish Independent. Retrieved 11 April 2019. ^ a b "Barry Keoghan would love to be among Irish acting greats". Raidió Teilifís Éireann. 15 February 2018. Retrieved 11 April 2019. ^ a b "Jessie Buckley and Barry Keoghan on BAFTA Rising Star shortlist". Raidió Teilifís Éireann. 3 January 2019. Retrieved 11 April 2019. ^ "The Creepy Kid from 'The Killing of a Sacred Deer' Will Punch You Out". Vice. 23 March 2017. Retrieved 23 October 2017. ^ "Norfolk review – maddening panorama of marshland weirdness". The Guardian. 22 September 2016. Retrieved 22 July 2017. ^ Lodge, Guy (25 January 2015). "Rotterdam Film Review: 'Norfolk'". variety.com. Retrieved 22 July 2017. ^ a b c Ford, Rebecca (12 May 2017). "Hollywood's Next Big Thing: Cannes Breakout Barry Keoghan Draws on Tough Upbringing for His Roles". Hollywood Reporter. Retrieved 22 July 2017. ^ "Barry Keoghan and Rachel Griffiths for Mammal". Irish Film and Television Network. 1 August 2014. Retrieved 22 July 2017. ^ Kelly, Aoife (30 July 2014). "Love/Hate star Barry Keoghan set to star with Rachel Griffiths in new Hollywood film". The Irish Independent. Retrieved 22 July 2017. ^ Corr, Alan (22 February 2017). "Trespass Against Us". Raidió Teilifís Éireann. Retrieved 22 July 2017. ^ "UK Shorts". The Panoptic. 26 September 2016. Retrieved 22 July 2017. ^ "'Light Thereafter': Rotterdam Review". Screen Daily. Retrieved 22 July 2017. ^ "Berlin: Blake Jenner, Barry Keoghan, Jared Abrahamson Join 'American Animals'". The Hollywood Reporter. Retrieved 22 July 2017. ^ "'Gaunt and thin' extras wanted for Black 47 famine film". The Irish Independent. Retrieved 22 July 2017. ^ N'Duka, Amanda (15 March 2019). "'Green Knight': Barry Keoghan & Ralph Ineson Joins A24's Fantasy Epic". Deadline Hollywood. Retrieved 15 March 2019. ^ Petski, Denise (11 July 2018). "'Y': Diane Lane To Star In FX Drama Pilot Based On 'Y': The Last Man' Comic Book Series; Barry Keoghan, More Round Out Cast". Deadline Hollywood. Retrieved 11 July 2018. ^ Niall (13 December 2017). "#Awards: The Dublin Film Critics Circle announce awards for 2017". Scannain.com. Retrieved 18 December 2017. ^ Lewis, Hilary (21 November 2017). "2018 Independent Spirit Award Nominations Revealed". The Hollywood Reporter. Retrieved 21 November 2017.